What's this? Good quality photos? Those who have been reading my blog since the beginning of summer might remember that I once filled this blog with amazing photos taken by my sister-in-law, Elyse. What I didn't mention is that I have another sister-in-law, Ashley, who also has an awesome camera and actually works at my school. More proof that I have the best family, Ashley has offered to help me with photos every so often, making her the third family member of mine to have a Flickr album devoted to photos of me. With her job and two adorable kids of her own, I won't be asking her to take my pictures every time, so a lot my pictures will still be taken with my not-so-great camera. Hopefully, though, I can least convince her to waste her time taking pictures of me a couple of times a week or so. In other news, today is the first day of classes so I suppose it's time to take my brain off vacation mode for now. I'm writing this in between my 10:00am weather & climate class and my 12:00pm public speaking class. Did I mention I spent much of the past two years taking major and minor related classes and now have to get those gen-eds in there finally? Awesome. I wore this on Saturday to a friend's pretty casual baby shower, meaning I still managed to be more dressed up than anyone there. Oh well, at least I finally got a chance to wear this shirt. Not only is lavender, but it's denim too. Madewell is by far my favorite store, but as a broke college student, I find it impossible to afford anything in there and am forced to weep every time I see it. By some magical force, I've actually managed to find two items, this shirt and a cardigan, on sale for about $15 each. My life is made...by Madewell. Fun fact #398: sometimes I think I'm funny. It's because I am. 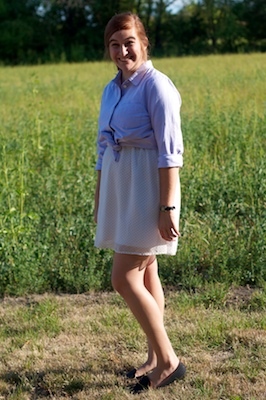 What a soft and feminine outfit, loving the lavender on you! Good luck with your first day back ! I can definitely see that you're back in the midwest by the location of the pictures (which are beautiful, by the way!). And I am loving those black loafers! 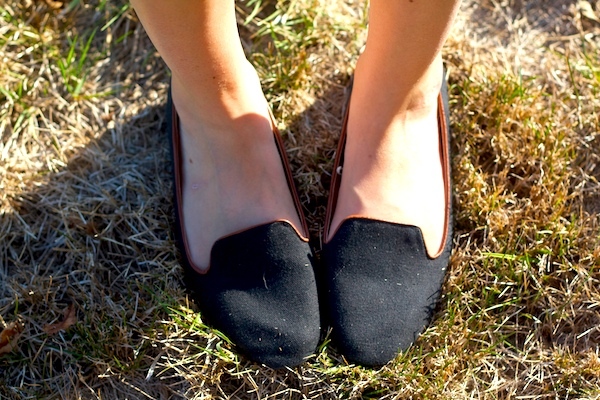 I MUST buy loafers this fall. Oh and P.P.S. Thank you thank you thank you for nominating me for the Liebster Award! I will most definitely be responding to your questions SOON! You are adorable. Love this outfit, the polka dots are just too cute. i love having family to take photos! i use my husband, it's so much easier than the tripod thing and i get better pictures when someone else is behind the camera because they can take more than i can. and i LOVE those loafers. and that skirt. perfect. This is by far one of my favorite posts! The outfit! The scenery! The cute face! Haha and I was JUST going to buy those shoes at Urban! The heel is so so adorable. Darn, we could have been twinsies. 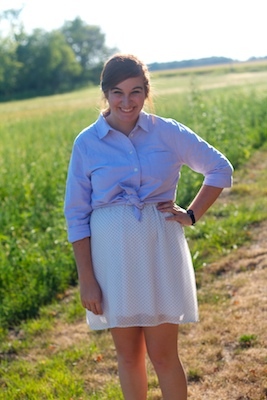 Love the light blues of the outfit against the field, so pretty! How lucky that you have family that can take your picture! I feel like usually I wouldn't ask friends to do it, so that pretty much leaves it to my BF or my tripod because my family lives far away! Anyway, you look adorable, we don't have a madewell by me so maybe thats a good thing for my wallet! Lovely post and outfit as usual :) haha, what exactly is a weather and climate class?? But I'm a total sympathizer; I'm squeezing in gen ed classes left and right next semester, including this science class about primates... my life..so much excitement. 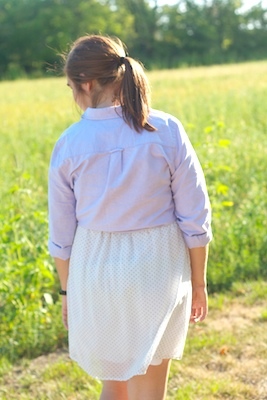 adorable skirt, I don't won a polka dot skirt but really want one. 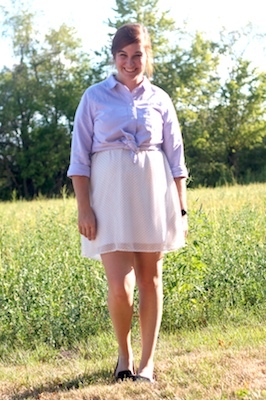 Great outfit post per usual! This is my kind of summer outfit!.. 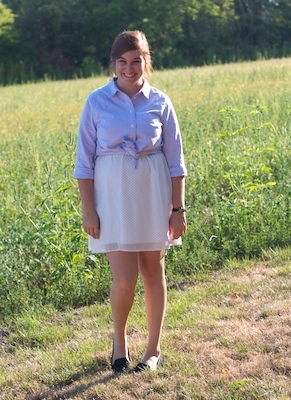 I keep tying button up shirts over dresses too. It's just so comfy & looks cute that way! Love those shoes! Lucky to have sisters to take photos of you! I have my sad and lonely tripod :) Happy first week o' school! Super adorable outfit! 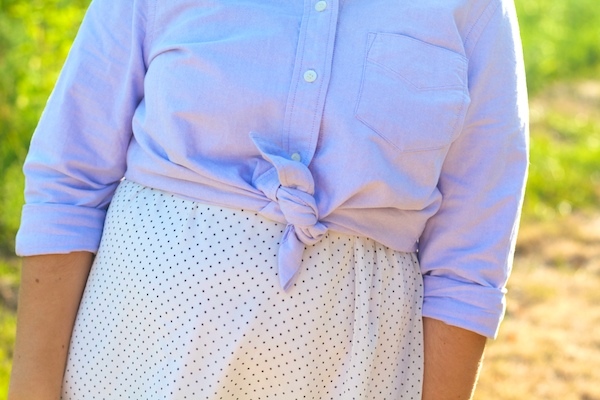 I love the lavender shirt! This outfit is so cute and I love the quality of these photos! They're as dreamy as you!